Application:38/42mm apple watch all models, Series 1, Series 2, Series 3. *This Apple Watch Band features a combination of functionality and style. Fine grinding and polishing wire drawing process for your elegant luster and texture. *There is only silver color for Your Apple Watch Series 1, Apple Watch Series 2, Apple Watch Series 3. 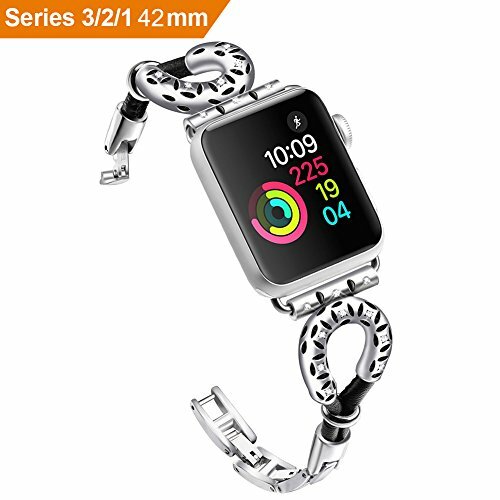 *Unique eye-catching special design,make your iWatch more special and attractive. Adjustable length:Fits 5.8''-8.1''(148 mm-206 mm) wrist. Classic Design: Never out of fashion, this watch band possesses a decent look for all men and women, making you standout from business to casual occasions. Free Warranty: 6-month warranty, 60 days money back. If you have any question, please feel free to contact us via email. If you have any questions about this product by Lisadream, contact us by completing and submitting the form below. If you are looking for a specif part number, please include it with your message.